On Thursday August 3rd, I (and my jeepin sidekick Molly) was ready and anxious to run "up" 709.1 trail and bring 23 fellow jeepers with me to join in the fun. About 10 of them were from the Bullhead 4Wheelers of Bullhead City Arizona, a great bunch of folks! 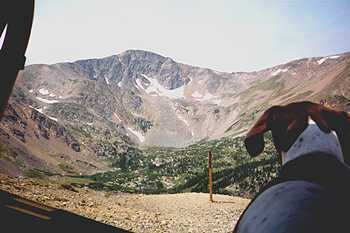 The official trip was Kingston Peak, but I renamed it to include Miner's Gulch (709.1-Up)/ Kingston Peak Loop/ Yankee Hill Trails. 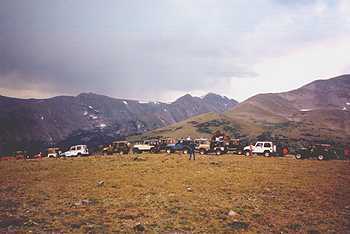 Some 20-odd jeeps pulled out of the staging area ready for a great trail in 709.1, and some tundra scenery of Kingston Peak. We headed up the Apex road, and went thru the private gate (a chain link) to which we got permission on Tuesday. Please do not access private land without asking first. We stopped for a 10-100 and to organize, and we were off to the 709.1 trailhead. 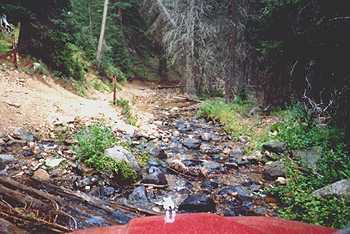 This trail (Miner's Gulch) could also be named North Clear Creek, since it runs along and in the trail. We reached to fun and locked in the 4WD for some fun wheelin'! 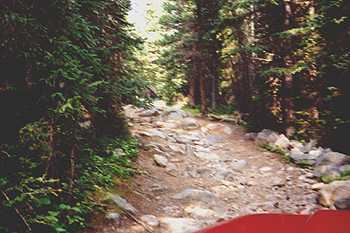 Right off the bat is a small boulder field, which turns into a small hill climb and more rock fields. 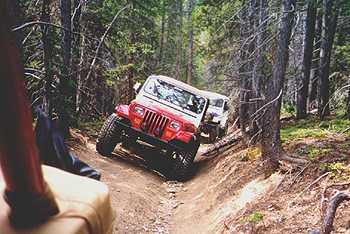 It's a good ¼ mile of real jeepin! After which you then you reach FS road 175.2 and stay straight for more ATV-like wheelin'. 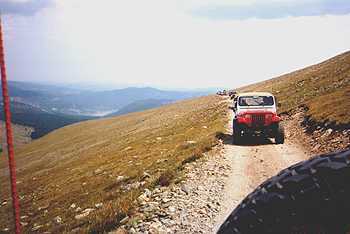 Now, you climb out of the valley with a jeep width's to spare as you avoid the numerous trees close to the trail and climb rock fields up steep hills on up to the saddle. 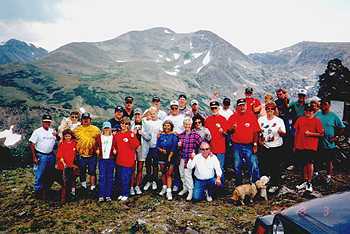 Once at the saddle, I led the group over the East side of Kingston Peak, and the tree-lined trail we took over the Hobo Run 2000. Not to technical, but a challenge to avoid trees and Rocky Mountain Pinstripping". 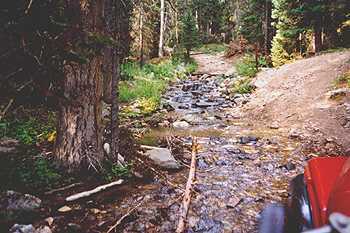 The trail crosses a few creeks and reaches the north end and a climb up to FS 353 and the main road around Kingston Peak. We all had lunch at the Hobo Run lunch spot at 11,500'. Ready for more, we trekked out onto the shelf road, and into the tundra with views of the Indian Peaks along the Front Range to the north. A small hill climb past the James Peak switchback, and we were at 12,100' and could now see south to 14,000'+ Mt Evans, Georgetown, and much more. We all stayed on the main trail, being very careful to "tread lightly" and not use the alternate non-rocky parts of the road like many do. In time the road will be so braided, the FS will soon close it down, so please stay on the main road at all times. when you arrive, you stack a rock and help build it, as it seems to be getting bigger every year!! The hill climb below the Rock House is steep and loose. Everyone made it up it and we all stopped to stack a rock and a group photo at the Rock House. After coming down thru the very old Bristle cone Pine forest, we all made it down to Alice. As on the Tuesday trip, I offered to take anyone to do Yankee Hill, and run back down the Miner's Gulch-709.1 trail, and all the Bullhead 4Wheelers were in. We climbed out of Alice, and climbed up Yankee Hill. 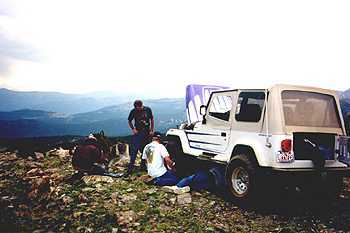 Once at the top, one of the Bullhead 4Wheelers with a YJ's fan was rubbing against his radiator. Come to find out, the left engine mount bolts had come out and the engine had shifted. They were able to jack up the engine and put in 2 of the 3 bolts in just to get down. Great teamwork in tools and deductive reasoning for a "quick fix" to the problem. So, since the main group was together, I decided to head down to Idaho Springs via Fall River Road and get gas too. 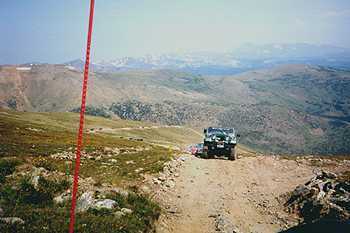 Heading back to camp, one has to drive the steep dusty (with no guard rails) "Oh My God Road" back up to camp. On Thursday night at 7pm sharp, Jim Provence and Jeff Carr were ready to had out over 340 "NICE" door prizes to registered jeepers who were present. How long does that take? 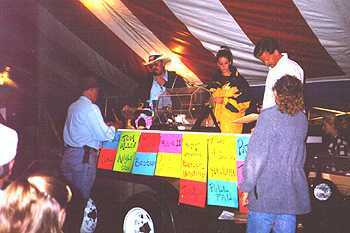 Well, at 11:45pm we had the raffle, and these guys were working as a team too…well done door prize committee!! I got my $20 worth of Children's Hospital raffle tickets, and not a one even came close. Who cares, it's all for the kids. Another fun night under the big top! The ever-so-popular "Door Prize Night" on Thursday night----was a great success!! 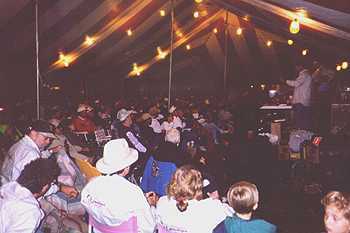 The big top was packed with eager participants waiting for their named called...! !